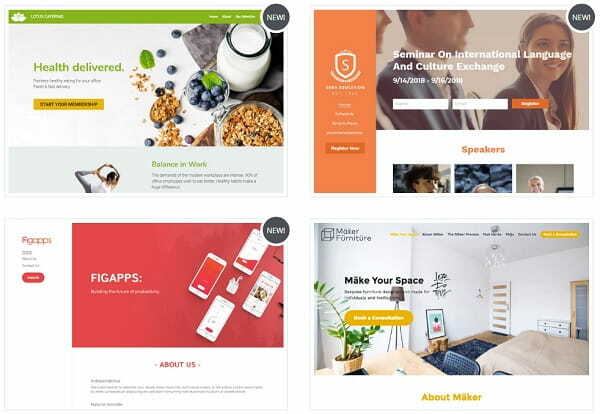 Strikingly – is a popular, easy-to-use and multi-faceted website builder, which targets different user categories, irrespective of their skills and expertise level. The system works great for the development of one-page and standard websites that let users focus on specific business/personal goals. The system does not require deep learning curve or programming knowledge. Founded in 2012, Strikingly has initially been focused on serving the needs of non-techies, who lacked web design skills yet needed one-of-a-kind projects to build reliable web presence of their services or products and to be able to present them to the advantage. Since the time of its launch, the platform has changed a lot, giving way to more advanced techniques, web design approaches and versatile user requirements. Have you decided to create a single-page website? Do you wish it to be impressive and functional at a time? Then why don’t you consider using Strikingly for this purpose? Join us in reviewing the system now to find out the features that make it stand out from the crowd and new options it has introduced since its last update. It’s high time to get started now! Ease-of-use is one of Strikingly highlights. Simplicity is revealed on each stage of the web building process: starting from the registration procedure and up to the final website publication. To sign up for the system, you just need to provide your first name, email and password. That’s it. Strikingly provides an intuitive editor that makes the process of web creation engaging and fun. It’s simple, beautiful and enjoyable. The editor offers a super quick tour to demonstrate all the system nuances to let you find out how to get the most out of using it. Launching a site with the service can take as little as one hour and requires no coding knowledge, unless you decide to use their advanced HTML/CSS editor that lets pro plan users make changes to the site’s header and footer. The entire website is comprised of sections you can modify to your liking (edit, add or delete those you need) directly in the dashboard. There are also Styles and Settings areas here. The first one lets you select and modify your website style or change the selected template on any step of the web design process. 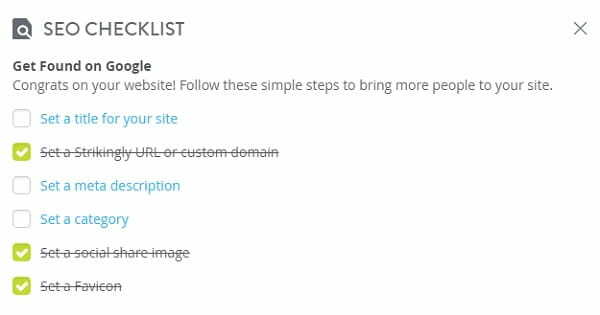 The Settings section, in its turn, lets you configure your website URL, domain name, select website category, modify header and footer, view and set up analytics and perform other must-have actions. One of the recent features is Layout switcher that gives you more flexibility in adjusting the placement of text and media within sections. As soon as you are done with your website design, don’t forget to activate the “Publish” button to make all the changes visible to a user. Strikingly now boasts a pretty impressive and rich feature set and it certainly has everything you need to start and modify a decent large-scale website. 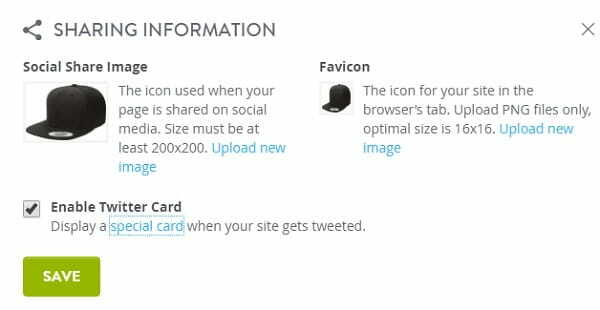 You can upload your own content, add custom domain, enable various ‘sections’ (media blocks, info boxes, contact forms and more) and also make slight changes to the site design. You can also add meta tags and view your website statistics using the system’s native monitoring application. To start a blog, simply add the Blog section to the page, and it will link to the individual post pages. When creating a new blog post, you can insert a variety of inline media including images, videos, call-to-action buttons, social bookmarking and quotes. It is also easy to rearrange your content thanks to the editor’s drag-and-drop functionality. The blog manager features a simple interface that allows to customize how your posts will appear in the new Blog section. Strikingly’s Simple Blog also has social sharing, commenting mechanism, and SEO functionalities. Apart from adding a Blog section to your website, you can also add a web store to it by managing the corresponding section. 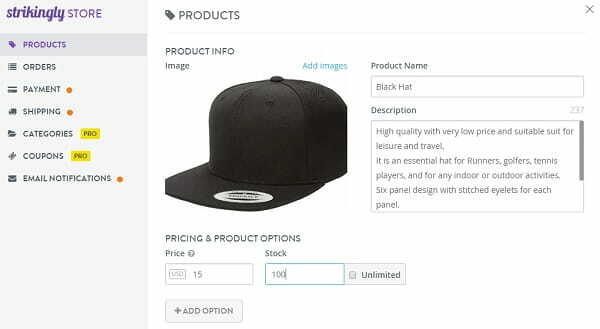 Simply enable it, add your products, and try out different layouts to customize your store style. After, set up your payment method (PayPal or Stripe) and check out the Order Management Dashboard. Strikingly will not take any transaction fees from the purchases. You will only have to pay the standard PayPal/Stripe transaction fee. You can sell one product under the Free plan, up to 5 products under the Limited plan, and up to 300 products under the Pro plan and up to 500 products under the VIP Plan. Strikingly comes with a convenient social feed section you can add and connect to your social media accounts. This gives you the freedom of actions, when it comes to managing and promotion your newly-built project, attracting target audience from the social networks. By means of social media integration, you can help your audience follow website updates, news and upcoming events. Mind that some of these features are available in terms of the paid plans only. The feature lets you view and analyze your website statistics and make the required changes on time. You can see the number of users visiting your website during a particular period of time (24 hours, last 7 days, last 30 days, last 90 days), the locations the traffic comes from, the most frequently visited pages, sources users give preference to when visiting your website (mobile or desktop), products or categories and other aspects that matter a lot for effective website management and promotion. The website builder lets you fill out the meta tags for your website or its separate pages (titles, descriptions, keywords), set category, favicon and social share image for your website as well as provides the detailed SEO checklist to give you a hint on what aspects you should choose to boost website Google ranking. SEO options are available in the Settings Section of the dashboard. The advanced tools make it possible to increase your project visibility by enabling Google site verification, adding keywords to heading texts, assign image ALT tags etc. Strikingly also has much to offer in terms of marketing. As of today, the email marketing tool is available only for Pro Plan users and implies an opportunity to embed the external MailChimp system into your project. It’s also possible to add contact pages and user forms in special website fields to get in touch with your site visitors. Strikingly takes care of its users’ security, offering multiple safety measures to protect ready-made websites from third-party access. With the website builder, you can enable and use Secure Sockets Layer (SSL) Certificate on any custom domain that lets your visitors access the website content via the HTTPS protocol. SSL Certification is provided by default. What’s more, Strikingly automatically saves your website copies when you edit them to let you restore the backup versions when necessary. Strikingly is mobile friendly: each theme is responsive from the start. There are mobile-specific options like click-to-call etc. There is also the iOS app that makes it possible for you to update and manage your website on the go. Since autumn 2018, Strikingly has made it possible to transfer the available domain name from another registrar. It’s also possible to get a new one within the system, no matter what plan you are going to use (even if this is a free subscription). The domain registration period extends for 10 years. At the end of the term, you can either lock the domain name or renew it based on the available aspirations. 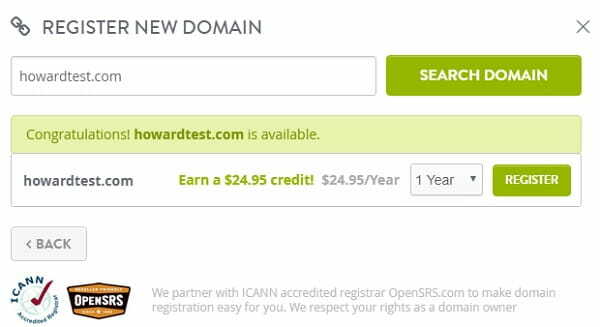 Finally, Strikingly now offers a more extensive selection of Top Level Domains like .shop, for example. As a result, your website can have more appealing and memorable address to stand out from the crowd. Strikingly currently offers a library of 29 beautiful modern designs optimized for mobile viewing from the start. You can filter them by switching between categories: business, startup, personal, portfolio, store and blog. 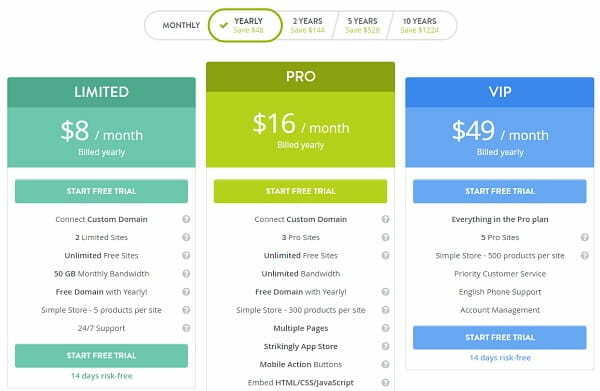 As opposed to lots of other popular website builders, Strikingly comes with the Template Switcher tool that lets you explore and test any of the templates without losing the submitted content. There’s no limit to how many times you can change the templates. The Preview option lets you see the way your website will look, if you select it for further customization. You can add a custom HTML code to your Strikingly website, but this option is available only in paid versions. The only drawback of that feature is that you can only inject a header and footer code, but not the website body. You can’t change the initial CSS code. It’s quite difficult to tell whether this is a serious drawback or not, as the prevailing amount of the system users don’t even know what CSS actually is. By the way, code injection option is available for Pro Plan users. The same category of the system subscribers can make use of the collaboration option. It lets you assign collaborators to work on the project development, which is also convenient and time-saving. Customer Support is what Strikingly really excels at. Irrespective of the seemingly simple nature of the website builder, it offers a powerful knowledge base with extensive help and support resources that are easy to browse and navigate. A useful Pre-Publish checklist (really handy!) and Idea Forum where you can share your suggestions on how to improve Strikingly, will also be of great help for newbies. The same is about starter video tutorials you can come across in the knowledge base of the support center. The Community Section of the website builder comprises the Blog, the Idea Forum and the Talk of the Town areas with tons of useful info on how to get the most out of using the platform. If there are still any questions left, you can contact the support team via email. 24/7 live chat assistance also helps get your questions and needs covered on time. The support team members are always ready to help you solve all the problems you may potentially encounter, when working with Strikingly. Thus, the Customer Support options deserve special attention here. There’s a free plan allowing you to publish a nice one-page website using Strikingly subdomain. To attach a custom domain name and unlock advanced editing tools, you have to upgrade your account. There are three paid packages here: Limited, Pro and VIP. These subscriptions come with a risk-free 14-day trial to let you test the options each system offers. The cost of the Limited Plan currently constitutes $12/mo, the Pro Plan will cost you $20/mo when billed monthly, Vip – $49/mo. If you decide to make a one-time annual payment, you can save up to $48. When paying for 2, 5 or 10 years with one-time payment, you can correspondingly save up to $144, $528 and $1224. Thus, the longer the duration of your paid subscription is, then more affordable it will eventually be. What’s more, the cost of the domain name is $24.95 per year, while that of the custom email c constitutes $25/year. Whatever website builder you choose for your personal or commercial project, it will still have its pros and cons. It’s a must to be aware of them before you make the final choice of the system to know what to expect from it and from the entire web development process. ✘ Limited applicability of one-page websites built with the system. When it comes to the choice of the most suitable website builder, it always makes sense to compare it with the major competitors. As to Strikingly, it is smart to compare the major aspects of the system with those of Weebly and Squarespace as both platforms target almost the same audience and offer similar feature sets. If we dive into the Strikingly vs Weebly comparison, we will clearly see the obvious advantages of the latter system. It is not only more popular, but it’s also more full-featured. While Strikingly is mainly used for building one-page websites, Weebly lets you create and add as many pages as you need for your project. The system is also most cost-effective and offers more flexible and deeper design customization options. It also offers more high quality responsive templates. Speaking about Strikingly vs Squarespace comparison, the first one also somewhat lags behind Squarespace. While Strikingly boasts more appealing templates for single-page blogs, landing pages, portfolios and small web stores, Squarespace is positioned as a full-featured website builder, the options and tools of which make it possible to compare it with a CMS for creating medium and large websites for creatives and entrepreneurs. Strikingly is a website builder, which encompasses ease of use, convenience and functionality. Most users give preference to it over lots of more popular systems due to its simplicity. The system mostly focuses on non-techies and, thus, its feature set, dashboard and interface are geared towards the needs of this particular audience. No coding is needed to use the system. However, if you are a Pro Plan user and have programming knowledge, you can get access to CSS/HTML footer and header editing options. The website builder can’t boast a rich collection of website templates, but those that are available in the system, are customizable and mobile-responsive by default. What’s more, Strikingly boasts fantastic customer support that can help you solve any platform-related issue. By using the website builder, you can effectively launch and manage single-page websites, connecting blogs and even web stores to them. There is no sense to expect great performance from such websites, but they will certainly come up to your objectives and expectations. All in all, Strikingly is a decent value for your money! Get started today, it’s easy!